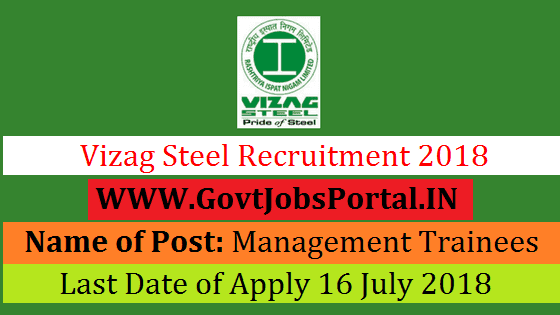 Vizag Steel is going to recruit fresher candidates in India for Management Trainees Posts. So, those candidates who are willing to work with this organization they May apply for this post. Last Date of Apply 16-July-2018. Total numbers of vacancies are 14 Posts. Only those candidates are eligible who have passed 60% marks in aggregate of all years / semesters & all subjects (50% in aggregate for SC/ST/PwD) in Bachelors Degree (Full time) as well in MBA / PG Degree / PG Diploma in HR Management / Personnel Management & Industrial Relations / Labour Welfare / Social Work/Marketing Management (with HR as main subject) from a recognized University. Indian citizen having age in between 18 to 27 years can apply for this Vizag Steel Recruitment 2018. Educational Criteria: Only those candidates are eligible who have passed 60% marks in aggregate of all years / semesters & all subjects (50% in aggregate for SC/ST/PwD) in Bachelors Degree (Full time) as well in MBA / PG Degree / PG Diploma in HR Management / Personnel Management & Industrial Relations / Labour Welfare / Social Work/Marketing Management (with HR as main subject) from a recognized University.